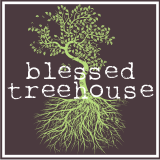 Blessed Treehouse: When God gives us warm weather . . .
. . . we put the kid to work! did you see my daughters new sink? only takes a little water to make most babies happy!